Chillibreeze believes in hard work and being a role model to the people of Northeast India and beyond. One employee reflects on his journey of 8 years and why he is still here today. It was on the 12th of July 2010. I was sitting at my desk in a call center, with my headphone on, talking to customers. It was my third month of taking calls and doodling at the same time. About 70% of my attention was on my doodling. In my defense, my English skills were inadequate. I was so weak in the language initially that I hated English. No one pushed me to get better at it so I stayed at the level I was at. Now, there was another company, a design company, located in the same building as the call center I was working at. It was called Chillibreeze and I was curious about it. One day I heard Chillibreeze was hiring. I quickly applied. There is no rational way to explain this but I had a strong feeling that I was going to grow and become somebody there. A week after I applied to Chillibreeze, I was called for an interview. I turned up to the interview armed with my 12th Standard certificate (my best till then), other certificates such as sports and such and of course, my digital artwork portfolio. The interview was an experience I will never forget. My profile was not a typical fit. I guess Chillibreeze saw potential in me and I was hired. I promised my interviewers that I would put in efforts to learn and would constantly upgrade my skills! It was the day I made the toughest commitment as a father and husband! I was responsible for my wife and my 2-year old little girl. I could not afford to fail to provide for them, hence I had better live up to the promises I made Chillibreeze! I joined Chillibreeze on the 15th of July 2010. My family was thrilled that I got the job, but at the same time, there were many negative inputs and ideas about the company from different people. Some people went so far as to say that Chillibreeze just wanted to exploit me, otherwise, why would they hire someone who had a formal education until only Grade 12. I could see why people had their doubts. Still, I followed my gut instincts and decided to trust the positive intent that I felt Chillibreeze had. I couldn’t speak proper English; I had no computer background of any sort. I struggled a lot in the beginning. Since the company did not have any training program when I started, I had to do a lot of self-learning. My teammates would help me whenever they could. I would also spend time at home learning on my own. The company gave us the learning tools and the freedom to learn anything we wanted. I made full use of the opportunity and resources, to learn as much as I could. Chillibreeze has had some ups and downs in the past 11 years, however with an attitude to learn from its mistakes and help other people grow and help them become their best, Chillibreeze survived it all and is stronger today. As I reflect on the years that went by, I feel Chillibreeze understands what I need, more than I do. I look at myself today and realize that I wouldn’t have been who I am today if Chillibreeze had not pushed me to keep raising the bar and getting me to upgrade my skills. We at Chillibreeze, are a family. We look out for each other. The company has doubled in size since the day I joined, but the company ’s tradition of care, hard work, and reliability, (which makes the company healthy and great) still stays the same. When I had completed six years with Chillibreeze, I looked back and took stock of how far I had come from who I was all those years ago. I realized that I had grown and become more mature and responsible. Chillibreeze gave me opportunities to constantly improve. This led me to renew my commitment to stay and continue to be part of the Chillibreeze family because I felt responsible for the growth of the company and its people, now and in the future. I was determined to fight against any negative intent and influences and help the company create more opportunities to serve global customers and grow as I did. This decision resulted in me being given a small team to lead. So, I decided to take the leadership role (not designated) to change attitude, behaviors, and mindset within that small team. Our guiding thought was to be a self-directed team which takes care of itself and our customers. 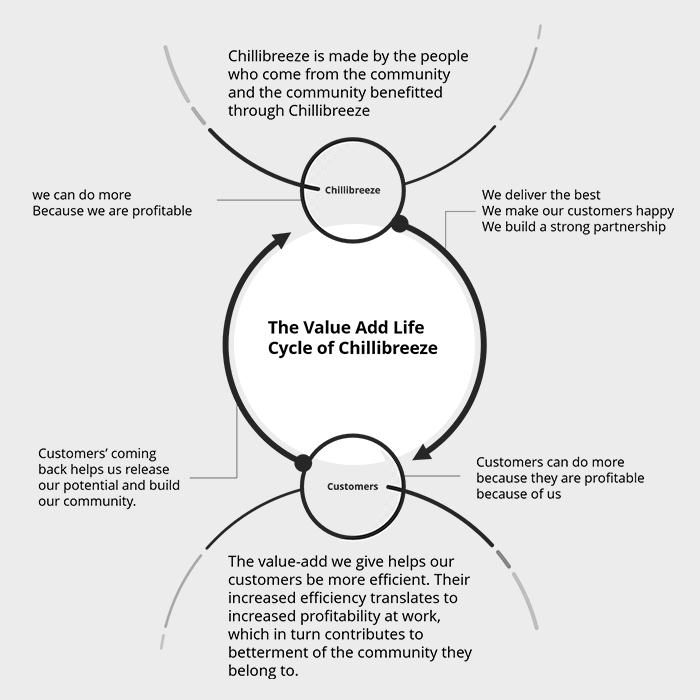 I showed my teammates the life cycle of Chillibreeze, thus giving them a bigger purpose of why they need to take care of our customers. Today we are strong and an expanding team.